The Consumer Electronics Show is typically an assault on your senses. There are flashing lights, blaring speakers, bizarre stunts, and this year, a yacht. Well, the Shenzhen 3iRobotics Co, LTD booth and a random guy snoozing while sitting upright in crappy chair offered us a perfect metaphor for CES 2019. It was sad, sleepy, and even a little bleak at times. Take the TV announcements, for instance. Basically, all that major companies like Samsung, Sony, and LG had to say was that the concepts they showed off last year were going to be on sale this year. There was a little talk about some cool new technology, but we didn’t really see anything we hadn’t seen before. Beyond that, there were a couple of cool concepts, like this transforming soundbar, and some cool new products like these indestructible pantyhose. 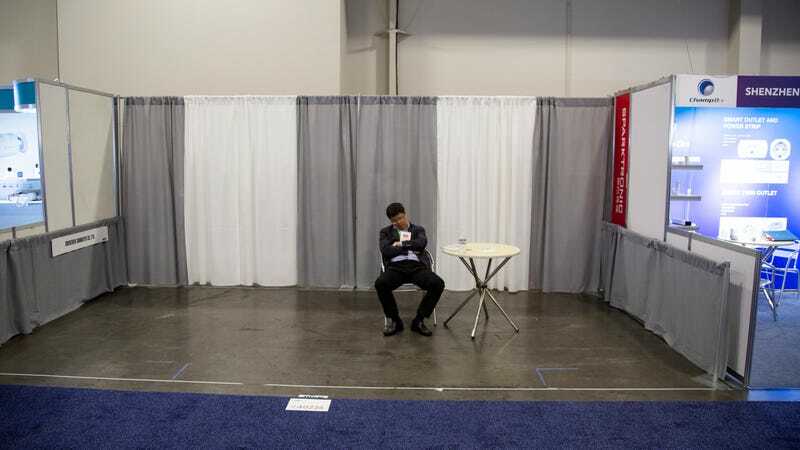 But that guy fighting jet lag in a drab empty booth by the back wall of the Sands Expo Center, he encapsulates the true spirit of CES 2019: boredom.